The latest addition to the camera phone accessories marketplace lets you peer down at the microscopic world – no lab required. Researchers from RMIT University and the University of Adelaide have developed a clip-on filter that can turn a camera phone into a microscope. What’s more, the developers are making the design open source and freely available, so all you need to own one is access to a 3D printer. The device lets you view specimens as small as 1/200th of a millimetre, including animal and plant cells, blood cells and cell nuclei. Beyond the ability to peek at your friendly neighbourhood microbes, this tech could be a game changer for field diagnostics and medical treatment in remote areas. “Our mobile microscope can be used as an inexpensive and portable tool for all types of on-site or remote area monitoring,” said Dr Antony Orth, lead developer and research fellow at RMIT University’s ARC Centre of Excellence for Nanoscale BioPhotonics (CNBP). The developers approached the design process by tackling two problems that limit the use of existing mobile phone microscopes. “Ideally a phone microscope should take advantage of the integrated flash found in nearly every modern mobile, avoiding the need for external lighting and power,” Orth said. According to the researchers’ paper, published in Scientific Reports, the clip-on resembles modern optical microscope designs. A lens is fitted into a notch on the clip and plays the role of the objective lens, while the phone’s camera lens acts as the tube lens. Most mobile phones have such a small pixel size (1.22 µm for iPhone 6 s, for example) that even a small amount of magnification can result in microscopic resolution. To address the issue of light, the team landed on a design that doesn’t require an external light source, instead relying on the phone’s built-in light – a point of difference between this device and similar ones already available. 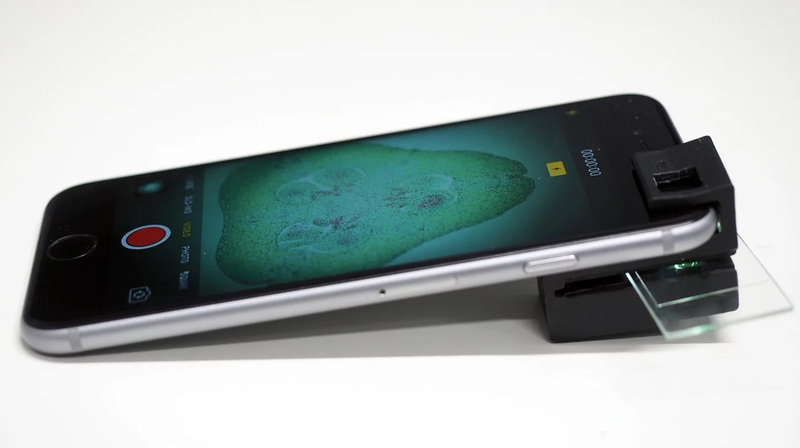 “We’ve designed a simple mobile phone microscope that takes advantage of the integrated illumination available with nearly all smartphone cameras,”Orth said. This is accomplished with internal illumination tunnels that guide light from the camera flash to illuminate the sample from behind. The device has dual brightfield and darkfield microscopy capabilities, meaning it can display specimens on either a light background or a dark background, depending on the type of visibility required. “Having both capabilities in such a small device is extremely beneficial and increases the range of activity that the microscope can be successfully used for,” Orth said. Using the camera’s own light source also streamlines the design and makes it more portable and easy to use. “External LEDs and power sources can make these other systems surprisingly complex, bulky and difficult to assemble. The beauty of our design is that the microscope is useable after one simple assembly step and requires no additional illumination optics, significantly reducing the cost and complexity of assembly,” Orth said. Mobile phone imaging technology has made huge leaps in the past few years, which makes it an attractive option for use in areas that might not have access to conventional equipment. Orth said he hopes this device can be used to improve healthcare and diagnostics in remote areas and developing countries. “Powerful microscopes can be few and far between in some regions,” he said. This iteration of the phone microscope has already been tested by Orth and his colleagues in a number of areas, and it has successfully visualised cell cultures and zooplankton. Keen to test it for yourself? You can access the 3D printing design files here.